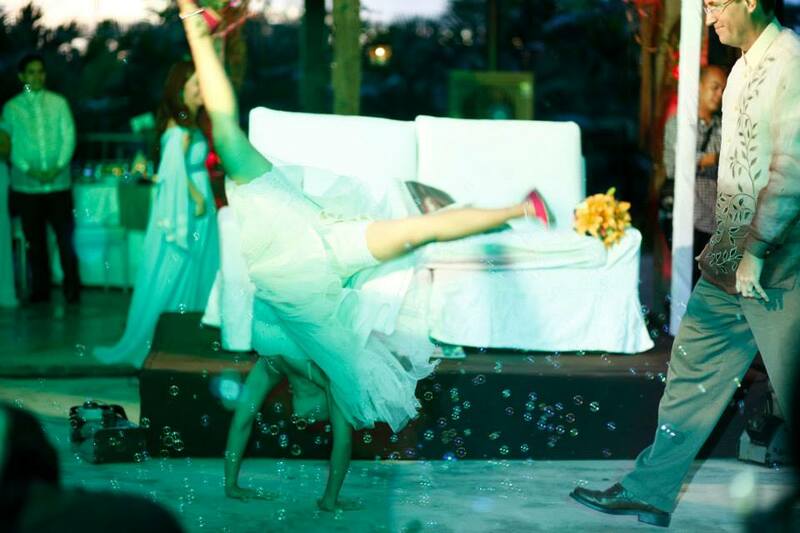 a cartwheeling bride = Boots & Jeff's "happy happy joy joy" wedding. Boots & Jeff had a very relaxed wedding preparation by booking the whole Le Blanc resort for family & friends. They decided to do this pictorial an hour or so before going to church. What's the theme of our wedding, you ask? Everything and everyone we love! :) - hiking, butterflies, pastel colors, gymnastics, Peanuts (not the edible kind but Charlie Brown and his gang), our dog named Belle, happy songs, fireworks, and of course, our family and friends! No one seemed to be in a hurry. Or stressed. What a CHILL wedding! 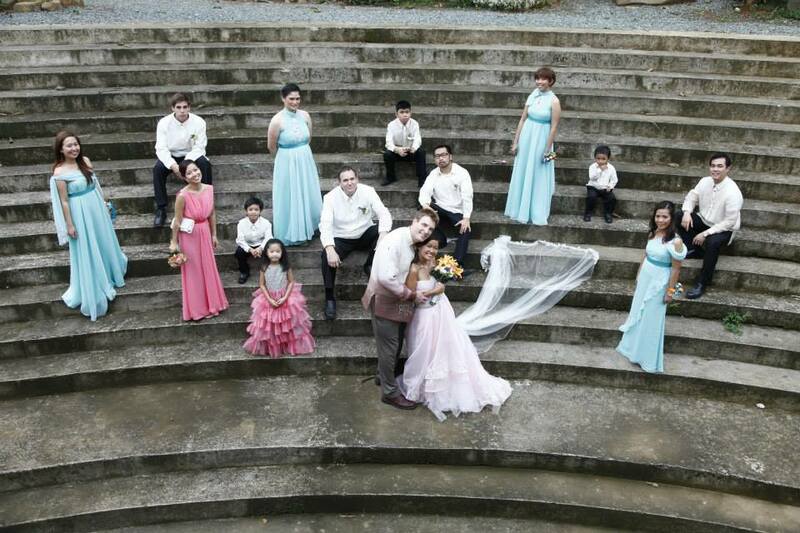 Our wedding was held on July 6, 2013 in Antipolo, the town where I grew up. While scouting for a venue, we wanted an outdoor theme. Eight months before the wedding, we discovered Parish of Immaculate Heart of Mary in Hinulugan Taktak Road. 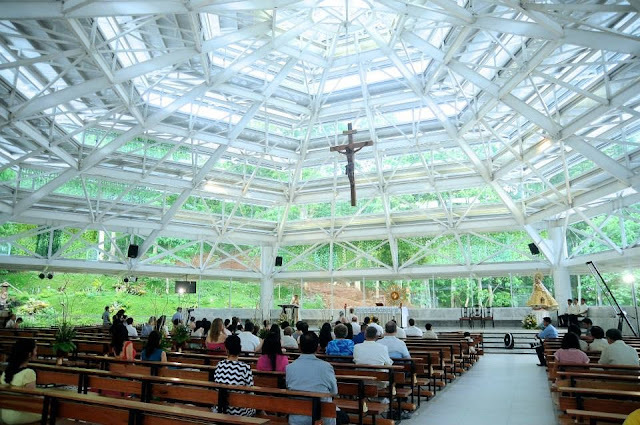 I have been going to the Philippines every year to visit but it was the first time that I saw the newly built church that was shaped like a dome with glass ceiling surrounded by greenery. That was the end of our search. 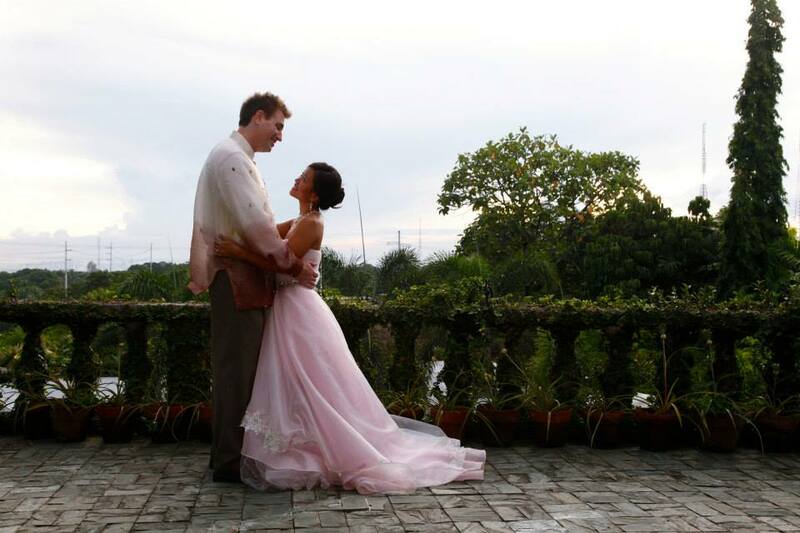 I imagined myself walking through an arch filled with flowers, white branches lined up, and petals scattered on the aisle as I meet my parents and Jeff at the altar. And that was exactly what happened! This is one breathtakingly beautiful church. One of the first things we did was come up with an invitation concept. 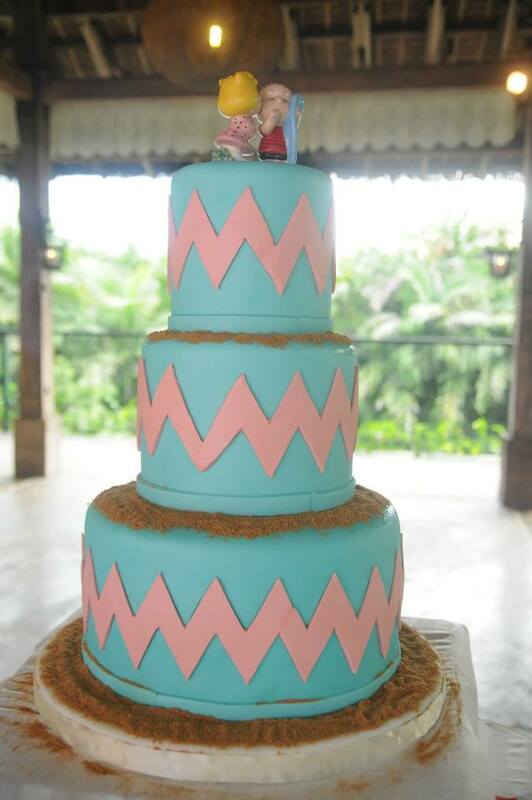 We all know the concept of "taking the plunge" to metaphorically mean getting married. We thought, why don't we do it? Literally. The spot was Turtle Cove, one of the popular cliff jump spots on Guam. The photographer was my brother, Bobby Bonifacio. "Let's make our invitation look like a postcard!" My graphic artist brother, Benji Bonifacio, did the layout that included the following elements - the picture of our cliff jump, aqua green and coral colors, a volkswagen, our hiking shoes, a seal with our silhouettes, butterflies, our entourage, and a map! It turned out exactly how we envisioned it. For our "pre-nuptial" pictures, we used existing hiking pictures (since we met while hiking on Guam after all) as well as pictures taken by Bobby and our friends Jet Apostol, Sofia Oropesa, and Tin Alam before, during, and after our cliff jump, on the beach, and in our new house that was still under construction. Now, what do we do with our dance? Despite dancing not being one of our brag worthy skills (although Jeff can argue about that at length), we chose "Linus and Lucy" from "A Charlie Brown Christmas" for our couple's first dance music. Do we do the Roger Rabbit? The Running Man? Do we approach a dance instructor? The answer is none of the above. We approached my gymnastics coaches, Melinda Heath and Ric Heath from Island Twisters Guam (with input from assistant coach Jushua Mayo) to choreograph our dance! The result - a dance with sachets, lifts, a back walkover, a cartwheel, and a flip! VTS 01 1 from Boots Lambrecht on Vimeo. We also had souvenirs prepared by my sister Rochelle Prado. She placed colorful pebble shaped chocolates in small mason jars. I drew caricatures of me, Jeff, and Belle for the label. Our gifts for the entourage were black wayfarer shades for adults and pixelated wayfarer shades for kids (my niece, Meg, and nephews, Diego and Julian among them) from amazon.com. 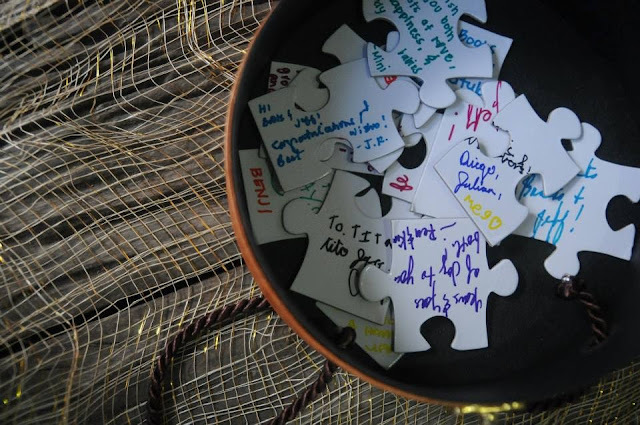 Since I enjoy assembling puzzles, we purchased white blank puzzle pieces (with numbers at the back) from etsy.com for our guests to sign on and for us to later assemble and display in our living room! After I told my friend, Karmeli Love Kintanar, that I wanted tulle for the material of my dress, she thought a blush gown would suit me. I was not meant to be the "bride all dressed in white". On the other hand, I thought it turned out dreamy! To make the dress convenient for our "Linus and Lucy" dance, she made the bottom a detachable long skirt that could be removed with in inner knee length layer that was perfect for twirling and doing a cartwheel. 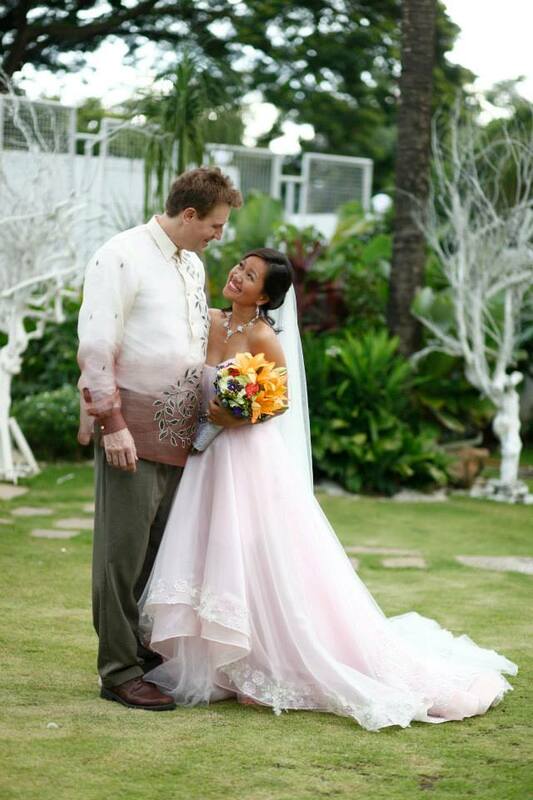 Meanwhile, Jeff's barong was a two-toned with hand painted leaves designed by Randolf Tuazon. We rented out Le Blanc in Antipolo so we could have a place to stay the night before the wedding as well as on the wedding night right after the wedding party. We stayed there with our families, friends from Guam as well different parts of the US. 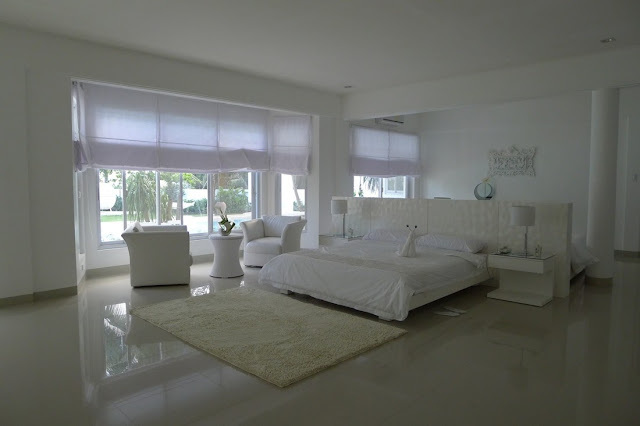 It was perfect for entertaining a small number of guests with 8 rooms, pristine white structures, white gardens, swimming pool, indoor basketball court, pool table, and an impressive Presidential/ Bridal Suite among others. On the morning of our wedding, our suppliers showed up one by one. Mica Tuaño-Fuentes was the make up artist and her mom, Grace Tuano was the hair stylist for me, Jeff, my mom, my sister, my bridesmaid, and my flower girl. Our photographer, George Padua (also my former co-worker) and his team arrived almost at the same time as our videographer, Threelogy Video, headed by CJ Lagman. 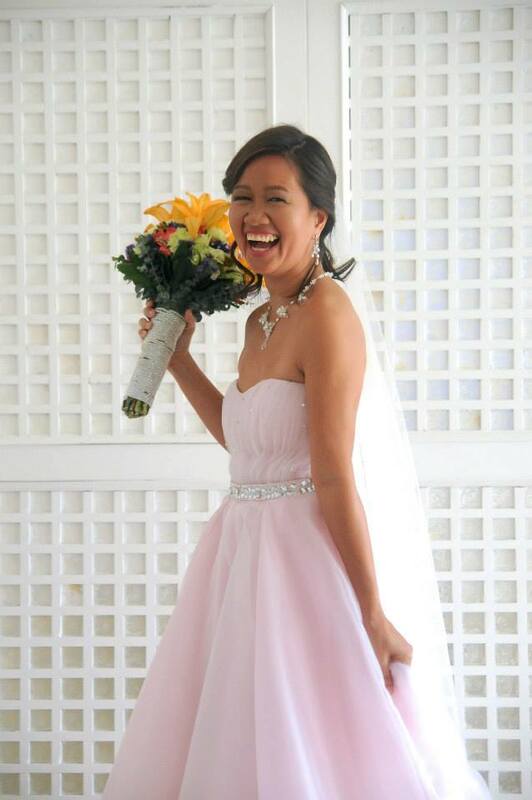 Patti Encarnacion brought my bouquet and the flowers for the entourage. She provided the beautiful decorations in the church as well as the reception area. 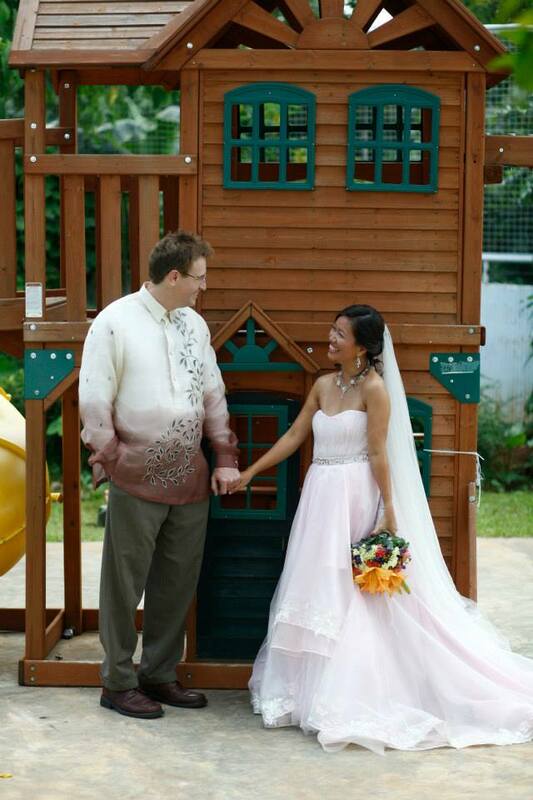 Prior to heading to the church, Jeff and I walked through different areas of Le Blanc such as the play ground and swimming pool while the photographers and videographers were shooting away. Our wedding reception followed. It was held in La Huerta Estates, a few minutes from Hinulugan Taktak Road. The estate is located on a hill in Antipolo with a lush landscape, a Spanish inspired architecture with a stairway leading to the main function area that is surrounded with Palm Trees. Before showing the wedding highlights, my brother, Bobby, and our friend, Jett Apostol, showed a surprise video that they prepared with Jeff's family and our friends in Guam who were not able to make it to our wedding! The exclamation point to end our wedding was the amazing fireworks that lit the sky with Katy Perry's Fireworks in the background. Thank you again for the gift of fireworks, Bobby! My parents have been very helpful from day 1 so we'd like to thank them for all their love and support. Thank you to my dad for leading us in prayer during the reception and for the touching and beautiful messages from our matron of honor, Rochelle Prado and Best Man, Marky Lambrecht. Despite not being physically present, Jeff's parents never failed to express how happy they are for us. In the end, it was not just our wedding but a wedding of people who have become and will continue to be a important part of our lives. It was a plus to have made new friends along the way. Several people have told us that however the day turns out, just remember to have fun and enjoy the moment. We did and it turned out to be a very happy start of our married life! Awwww :) Such a positive and inspiring way to start a marriage. Thank you for sharing this with us, Jeff & Boots! lovely dress & lovely couple.